iRig Mic HD 2 comes complete with all the accessories to get the most out of it in any situation: a carrying pouch, a compact table tripod, a mic stand adapter, a 5/8" to 3/8" thread adapter and comes with a Lightning iOS cable and a USB cable for device connection. The completeness of options and performance-related features make iRig Mic HD 2 the only microphone available to truly meet the needs of a wider audience of users, from professional to enthusiasts who wish to achieve great results, anywhere without breaking the bank. iRig Mic HD 2 delivers incredible performance giving you the ability to record your instruments or vocal performances with 24-bit resolution and sample rates up to 96kHz. It utilizes a high-quality, gold-sputtered electret condenser capsule that ensures exceptional transient and frequency response (20 Hz - 20 kHz, -3 dB) along with enhanced durability, and the integrated low-noise preamp lets you dial in just the right amount of gain for the optimum signal level. Able to withstand a maximum sound pressure of 125dB, iRig Mic HD 2 will stand up to recording even very loud sources and the cardioid pickup pattern will help reject unwanted sounds from back side of the microphone. This makes it perfect for a multitude of applications where audio quality is paramount along with versatility and freedom of movement. Both in the studio and on the go, iRig Mic HD 2 is much more than just a digital USB microphone; it is a comprehensive tool for boosting your creativity and the quality of your audio content with all the convenience of a handheld form factor. This can also come in handy to send the signal out to an external device like another recorder, a mixer or a PA system. 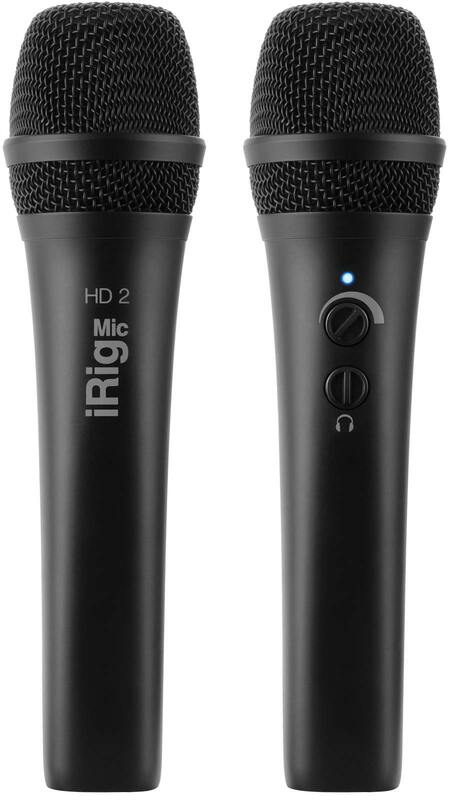 Key to iRig Mic HD 2’s broad compatibility is its selection of included detachable cables. The mic comes with a Lightning connector cable and a USB cable. This covers you for the latest generation of iPhone, iPad and iPod touch devices, and it also gives you the flexibility to connect directly to your Mac or PC. Not only does iRig Mic HD 2 come complete with all the cables needed to hook it up, but also with the necessary “add-ons” to help you get the most out of it right out of the box. You get a sleek carrying pouch that will help you protect the microphone while traveling or when it’s stored. You will also find a mic stand adapter with a 5/8" to 3/8" thread adapter for use with a mic stand on stage or in a studio. We also included a handy table tripod, perfect for using the microphone during conferences, radio shows, video calls etc. iRig Mic HD 2 comes with a full suite of software that lets you start processing and editing vocals (or any other audio source) straight out of the box. 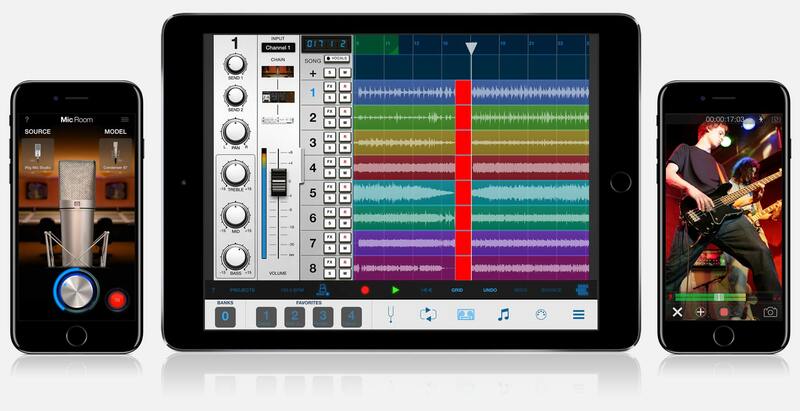 iPhone, iPad and iPod touch users will enjoy the included versions of the Mic Pack for VocaLive, that adds a collection of virtual microphone models to the real-time vocal effects processing and multitrack recorder app; Pro Bundle for iRig Recorder, which adds essential processing like equalization and compression to the pro-audio recording and editing app with video; and Mic Room, a recording app that features stunningly realistic virtual models of some of the most desirable microphones of all time. iRig Mic HD 2 also comes with Mac and PC software including Ableton® Live 10 Lite™, a Digital Audio Workstation application; T-RackS Classic collection of audio processing plug-ins; and Mic Room, the microphone modeling collection. iRig® Mic HD, iRig® Recorder, AmpliTube®, VocaLive™, are trademarks or registered trademarks property of IK Multimedia Production Srl. All other product names and images, trademarks and artists names are the property of their respective owners, which are in no way associated or affiliated with IK Multimedia. Product names are used solely for the purpose of identifying the specific products that were studied during IK Multimedia’s sound model development and for describing certain types of tones produced with IK Multimedia’s digital modeling technology. Use of these names does not imply any cooperation or endorsement. iPhone®, iPod touch®, iPad®, Mac and the Mac logo are trademarks of Apple Computer, Inc., registered in the U.S. and other countries. App Store is a service mark of Apple Inc.